King size bed (2 single beds pushed together), an en-suite bathroom (shower only), a television with select DSTV bouquet channels, work desk and a complimentary tea and coffee station. Carport in front of room. Double bed with an en-suite bathroom (shower only), a television with select DSTV bouquet channels, work desk and a complimentary tea and coffee station. Parking in front of room. 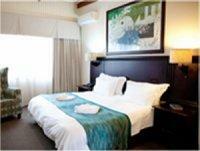 Deluxe & Family Rooms, with 2 x single beds pushed together & a sleeper couch for 2 children. En-suite bathroom with shower and bath, work station, small fridge, TV with select DSTV bouquet channels, work desk and complimentary tea and coffee. Carport. King/Twin beds with an en-suite bathroom (shower only), a television with select DSTV bouquet channels, work desk and a complimentary tea and coffee station. Parking nearby. Double bed with an en-suite bathroom (shower only), a television with select DSTV bouquet channels, work desk and a complimentary tea and coffee station. Parking nearby. Two double beds, an en-suite bathroom (shower only), a television with select DSTV bouquet channels, work desk and small kitchenette, complete with necessary equipment for self-catering purposes. Parking outside. The largest of our suites, the Honeymoon suite offers a king size bed with en-suite bathroom with bath and shower, a television with select DSTV bouquet channels, a work desk, and a complimentary tea and coffee station. Carport in front of room. Check-in is from 14h00 on the day of arrival, and check-out is by 10h00 on the day of departure. All extras are to be settled prior to departure. We will however endeavour to accommodate guests for an earlier check-in or a late check-out time if requested, subject to the availability of rooms.